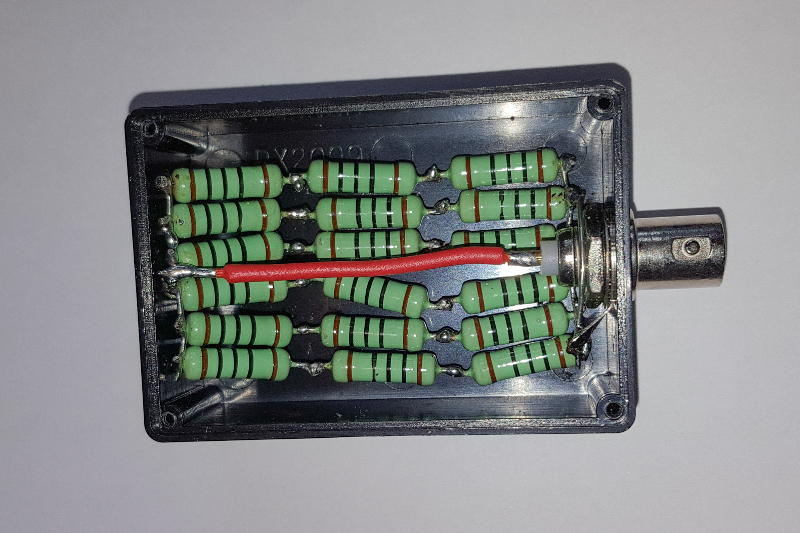 Here is an easy project involving a BNC connector, small plastic box and eighteen 100-Ohm 2W resistors. Total resistance is of course 50-Ohms. What is the total power handling? Re: Easy Dummy Load Project. What is the total power handling? I'll comment because I've seen quite a few engineers miss this one. You've got 18 resistors rated for 2W so 36W...for a short time. Actually, the the pulse handling ability of the resistors is much more than 2W. I wouldn't hesitate to put a few 100W dits or dahs into it. But then I would wait quite a while for it to cool down. I estimate you can't leave it cooking key down with more than 5W before the box starts to get soft.